Previously, on MinerBumping... We began our examination of different categories of the New Order's enemies and what makes them oppose the Code. "You didn't follow your own Code!" Ah, the Space Lawyer. Entire volumes could be written about him. But we don't need volumes, because the Space Lawyer is quite simple--much simpler than he'd like to believe. The motivation of the Space Lawyer comes down to one thing: rules. There's nothing objectionable about that, for as we all know, highsec does have rules--it has the Code. So where does the Space Lawyer go wrong? The central problem of the Space Lawyer is that he commits himself not to the rules as they actually are, but as he wrongly believes them to be. 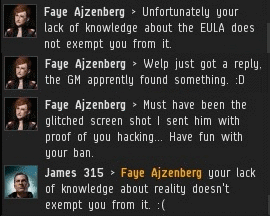 He might, for example, think that the EULA doesn't allow players to shoot each other in highsec, or that it forbids the bumping of miners. We don't know precisely where the Space Lawyer gets his ideas, for they certainly don't come from a careful study of the rules--or even a cursory reading of them. Yet in his overweening confidence, the Space Lawyer is absolutely convinced of his own position, even when it's debunked by those who know better. In the early days, the Space Lawyer was primarily concerned about fighting the evils of bullying, harassment, and extortion, which he defined as anything that prevents the highsec carebear from gathering isk. Such Space Lawyers still exist; we occasionally see Space Lawyers who think it's against American law to demand payment for a mining permit. Nevertheless, four years of Code enforcement has thinned the ranks of those who believe highsec combat violates EVE's Terms of Service. Another victory for the New Order! Like a deranged Pokémon, the Space Lawyer has evolved. We caused this evolution, as the Agents of the New Order are also the agents of progress. Now the Space Lawyer is mostly fixated on EVE's most important set of rules--the Code. Sadly, the Space Lawyer cares only for the twisted version of the Code that exists in his own mind. Intriguingly, Space Lawyers from all across highsec share similar delusions. Nearly all of them read into the Code a provision forbidding Agents from ganking unlicensed miners without first attempting to convo them. No such provision exists, of course, but they feel that imaginary rule to be more real than the rules actually in the Code--such as the one about buying a permit. Agents of the New Order represent truth and reality; they enforce the rules as they're written, not as the Space Lawyer wishes them to be. Conflict is inevitable. "I'm not a highsec miner." When you travel to a highsec asteroid belt and see a Mackinaw mining there, you might assume you're looking at a highsec miner. This assumption would tend to be reinforced if you were to observe that same Mackinaw pilot from day to day and always found him mining in highsec. And if you were to gank this pilot's Mackinaw, you would probably see nothing wrong with proudly declaring to the world, "I ganked a highsec miner!" But if that miner happened to be a Self-Denying Miner, you'd soon hear an objection. The Self-Denying Miner does not identify himself as a miner. He always imagines himself as something else. He may have a "main" with some PvP skills. His other character might even reside outside of highsec. Or he might not have such a character yet, but intends to train one in the future. Or he might not even have plans to train another character. For the Self-Denying Miner, it does not matter what other characters he might have, just as it doesn't matter that he spends virtually all of his time on a character that does nothing but mine. He's not a miner, you see. Sometimes the Self-Denying Miner will have his excuses: "I was only mining for a mission." Or perhaps, "I was only mining ice for my lowsec corp's POS." Or even, "I only do this when I'm watching Netflix." He's not really a miner; the time he spends mining is just the exception to the rule. It doesn't trouble him that nearly all of his time is spent on these exceptions. Because the Self-Denying Miner doesn't need excuses. He may offer none. He declares himself not a miner, and that is that. If he were right about that, then he'd have no reason to hate an organization that ganks miners. But for some mysterious reason, he does. As with the Space Lawyer, the friction between our Agents and the Self-Denying Miner is created by their opposing attitudes about the value of truth and reality. The New Order embraces truth and reality; the Self-Denying Miner recoils from them. Unsurprisingly, in the battle between Agent and Self-Denying Miner, the Agent is always victorious. "People who complain about CODE. on the forums are just CODE. alts looking for publicity." The rejection of reality is a common defense mechanism among our enemies, but for the Denialist, it is an all-consuming one. For the Denialist does not engage in mere wish-fulfillment; he is driven by an abject fear, an absolute terror. He sees the rise of the New Order and is petrified by what it bodes for the future of highsec. The Denialist was a prominent fixture of the New Order's earliest days. He would see an Agent or two bumping miners and declare that they must be my alts. And the New Order's shareholders, too, must either be alts or their share purchases fictitious. Because if the Agents and shareholders weren't my alts, then the New Order was more than just some lone nut in Halaima. It would mean a pro-Code movement was growing, and might continue to grow. When the New Order was smaller, it was easier to be a Denialist. As the concept of a one-man conspiracy grew ever more fanciful, the Denialist had to adapt. The buzz on EVE-O was dismissed as alt-driven. The expensive killmails must've been staged. And the scrupulously documented outpouring of the tears of hundreds of miners? "Meh, seems made up." Soon the Denialist accepted that the New Order was too vast to consist of one man, but perhaps several very, very busy men could accomplish it all. The Denialist held to his delusions for as long as he could. To abandon them was to accept that he was witnessing the twilight of the age of the carebear, that highsec was going to change. But as the carebears lost tens of trillions of isk at the hands of the New Order, the Denialist, too, was forced to evolve. The new breed of Denialist declared, "Yes, the New Order existed, but now it is dead and will exist no more!" The new Denialist was no less desperate than the old. He looked in every corner for evidence that the CODE. alliance was disappearing, or at least on the decline. "Aside from the people who gank freighters, nobody ganks freighters anymore. And other than CODE. 's miner gankers, they don't even gank miners!" Over and over throughout the years, he declared one event or another to mean the end of the Code. The facts have been no kinder to the new Denialist than they were to the old. And a Denialist's ship is pierced by antimatter just as easily as anyone else's. He remains fearful at all times. 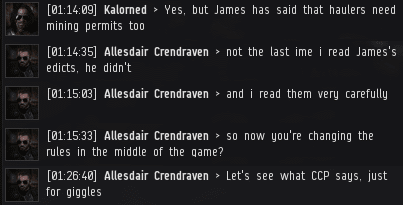 Kalorned: "Yes, but James said..."
..."haulers need mining permits too..."
Yes, I've met all these attitudes in the course of my travels in Highsec. I nod my head in agreement as James paints a mini-portrait of each of them. It's like the Bingo Squares, only quite sad really, for his subjects are all absconders from the Reality which James so helpfully and skillfully holds out to them - in the form of the Code. \o/ This is a great series! This is an insightful and well ordered taxonomy, that will doubtlessly prove helpful in classifying the distribution of miners throughout New Order sovereign territory. I like the bot aspirant definition the most as i have found that disease to be on the increase the most since alphas are in the mix.